The center channel is perhaps the cornerstone of your surround sound system. The majority of the dialogue you hear comes through that speaker. If you can't understand what is being said, are you even really watching the movie? Our center channel speakers are designed to deliver clear and crisp movie dialogue. No other brand on the market can deliver the realistic detail and emotion like Klipsch. Isn't it time you hear what you've been missing? Our flagship center channel speaker, the RC-64 III delivers real-to-life, front row, cinema-quality acoustics. Featuring quad 6.5" cast basket Cerametallic woofers, an all-new titanium compression driver, Tractrix horn-loaded tweeter and more. Crafting this incredible finish of Klipsch’s most popular home theater speaker series requires undergoing a tedious three-coat paint and polish process. By delicately fabricating each layer, the result is a deep and vivid reflection that only a true piano black finish possesses. Redesigned from the ground up, the Reference Premiere series leverages over 70 years of Klipsch signature acoustic expertise with cutting-edge technology to deliver the ultimate home theater solution. 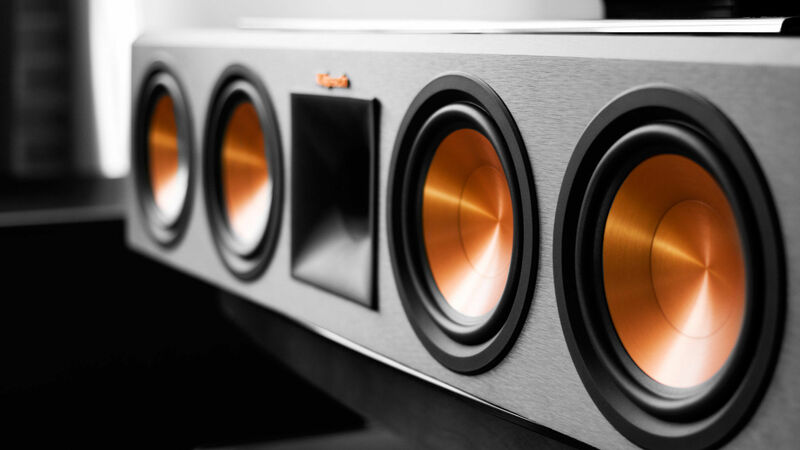 Leveraging our proprietary 90x90° Tractrix® horn-loaded technology and iconic spun-copper IMG woofers, the Klipsch Reference series center channel speakers' enhanced features and new design deliver lifelike acoustics that bring your music and movies to life. Dimensions: 5.2" x 26" x 6.2"